﻿ Best Price on Tropical Court Resort in Montego Bay + Reviews! 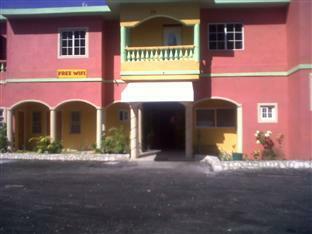 This complex is 5minutes’ drive from Doctor’s Cave Beach and just 0.6 mi from Sangster International Airport. It features a swimming pool, sun terrace and free Wi-Fi throughout. The basic-décor rooms offer air conditioning, a fan, telephone, mini-bar and cable TV. The bathrooms private and come with shower and hairdryer. Guests at Tropical Court Resort will enjoy Red Stripe beer at the bar and a TV lounge. There are banquet facilities and a meeting room. Vending machines are also available. Tropical Court Resort is 5 minutes’ drive from Blue Diamond Shopping Mall and 1.9 mi from Coral Cliff Casino. Montego Bay Beach is 7 minutes’ drive away.